External finish and burners AISI-304 (18/8) stainless steel. Rectified steel sheet 12 mm thickness (8 mm in low cost models PG-600 & PG 800). 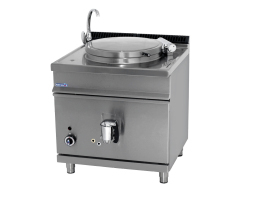 Tubular burner under plate with ignition pilot and thermocouple for gas models, control thermostat and switch on light for electric. Tubular electric elements for electric models. Possibility to choose plane or plane/grooved area. Possibility to connect gas on both sides. Dimmensions: 1.005 x 490 x 230 mm. 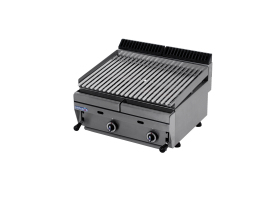 Under plate burners: 3.00 Kw: 1 Unit. 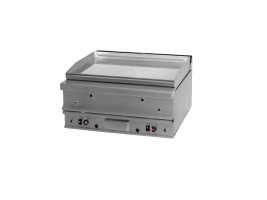 Under plate burners: 6.50 Kw: 2 Units. External finish and burners AISI (18/8) stainless steel. Rectified steel sheet 12 mm thickness (8 mm in low cost models PG-600 & PG-800). Dimmensions: 605 x 440 x 230 mm. 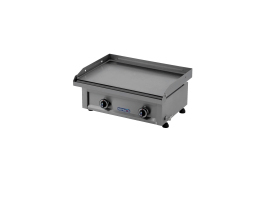 Under plate burners: 6.50 Kw: 1 Unit. External finish AISI-304 (18/8) stainless steel. Adjustable stainless steel grid with ceramic briquettes. Grease conduit for all models. Dimmensions: 600 x 550 x 260 mm. Burners: 7.00 Kw: 2 Units. External finish, tank and cover in stainless steel. In electric models thermostat control from 105º to 195º C, with security thermostat and shielded resistances. In gas models MINISIT gas valve control from 110º to 190º C, with security thermostat, pilot and piezoelectric. Temperature fast recovery with termo-pila system in gas models. Residue filter in all stand models. Dimmensions: 700 x 600 x 360 mm. Total power: 6.30 + 6.30 Kw. Tubular burners and thermostatic valve control from 30º to 100º C in gas thermos models. Regulation tap in pasta cooker. Shielded electric elements and thermostat control from 30º to 90º C in electric models. Filling (except BM-45/E and BM-65/E) and pouring taps. Dimmensions: 400 x 750 x 850 mm. Recomended kegs: 2 of 1/3. Plane, grooved or plane/grooved top. Rectified steel sheet of 15 mm. thickness or covered with 20 mm hard chrome. (50 - 100 microns). 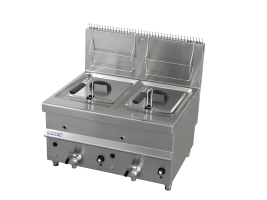 Stainless steel tubular burners with security taps, thermocouple and ignition pilot. Rectangular electric elements in electric models. MINISIT thermostatic valve from 100º to 285º C and security thermostat in hard chrome models. Grease box for all models. Dimmensions: 800 x 750 x 350 mm. Under plate burners: 8.00 Kw: 2 Units. External finish, tank and cover stainless steel. Tubular burner, thermocouple and ignition pilot in both models. MINISIT thermostatic valve from 0º to 205º C with security thermostat in SB-730 and SB-940. Pouring tap in boiling pans. Dimmensions: 800 x 750 x 850 mm. Made of AISI 304 18/10 stainless steel (except models 3, 6 and 10). 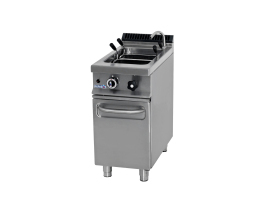 Stainless steel burners and fans. Round chamber with tempering glass door. Internal lights (except model H-3). Analogic controls (except model 3). Possibility of a heart core equipment (except models H-3, HGA-6 and HGA-60). Bidirectional fan (except in model H-3,). Models 201 and 401 with internal trolley incluided. It is recommended a chest under ovens models 201 & 401. Dimmensions: 927 x 845 x 886 mm. Capacity: 6-GN 1/1. 6-600 x 400. Steam production with water direct injection. Possibility of heart core probe equipment. Humidity control (60, 100 and 200). 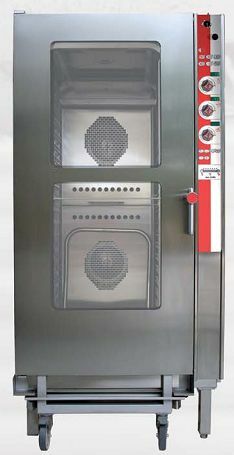 Self-cleaning system.Models 201 and 401 with internal trolley included. Dimmensions: 930 x 921 x 1.925 mm. Anti-grease filter and internal lights. Total control with only a Joystik®. Automatic humidity control Joyclima® system. Memorizing of recipes and programs. Double speed and bidirectional fan. Models 201 and 401 with an internal trolley included. Equipped: 1 grid + 1 detergent carafe + 1 polisher carafe. Dimmensions: 930 x 921 x 1.180 mm. Capacity: 10-GN 1/1. 10-600 x 400. External finish AISI-304 stainless steel. Open fire top with security valve and thermocouple. Burners with mechanized brass covers and cast iron grids. Grids dimmensions: 412 x 382 mm. 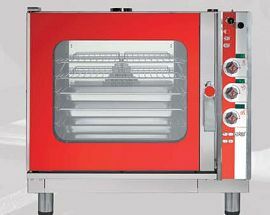 Enameled ovens with valve tap, thermocouple an grate, dimmensions 580 x 400 x 385 mm. Dimmensions: 1.200 x 550 x 850 mm. Top burners: 6.00 Kw: 1 Unit. Top burners: 8.00 Kw: 2 Units. Grate: 1.70 Kw: 1 Unit. Oven burners: 4.50 Kw: 1 Unit. Open fire top with ignition pilot, security valve and thermocouple. Burners with mechanized brass covers and melted iron grids with antacid enamel. Grids dimensions: 395 x 290 mm. 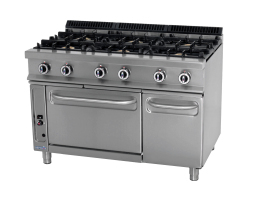 Stainless steel ovens with ignition pilot, MINISIT thermostatic valve and thermocouple, dimensions 540 x 590 x 315 mm. (stainless steel burners). Dimmensions: 1.205 x 750 x 850 mm. Top burners: 6.50 Kw: 3 Units. Top burners: 8.00 Kw: 3 Units. Oven burners: 7.50 Kw: 1 Unit. 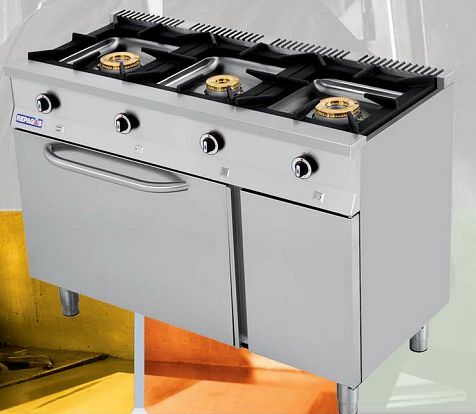 Burners with mechanized brass covers (except models HP-26 and HP-26/M) and cast iron grids with anti-acid enamel. Grids dimensions: 395 x 365 mm. 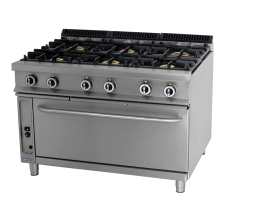 Stainless steel ovens with ignition pilot, MINISIT thermostatic valve and thermocouple, dimensions 540 x 740 x 315 mm. (stainless steel burners). Electric elements in electric models. 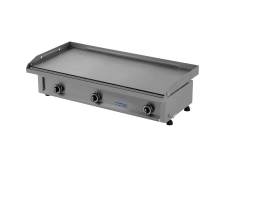 In C-961H model extra large oven dimensions 940 x 740 x 315 mm. and stainless steel burner. Dimmensions: 1.205 x 900 x 850 mm. 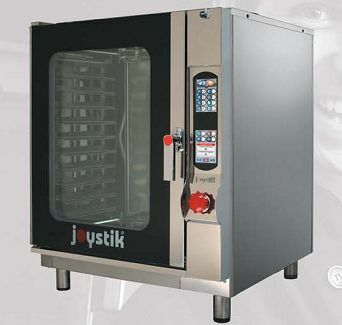 Oven burners: 14.00 Kw: 1 Unit.Power: 57.50 Kw.